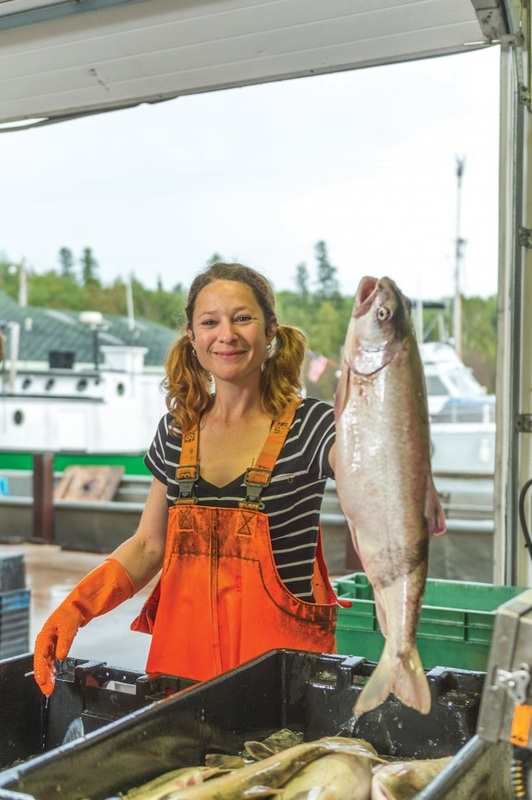 Jessica: The Lake Superior fish that we catch at Halvorson Fisheries in Cornucopia, Wis., is extremely clean and fresh. It’s caught daily, processed the same day and goes out to local restaurants and consumers the same day. What is your job and the biggest challenge you face doing it? Jessica: I wear many hats at Halvorson Fisheries. I actually go out on the boats to catch the fish. I help with the filleting process. I help in the fish market. I mend gear and make new nets. I do some of the paperwork and a lot of the computer work associated with federal and state rules, regulations and laws. Probably the latter is the most challenging. 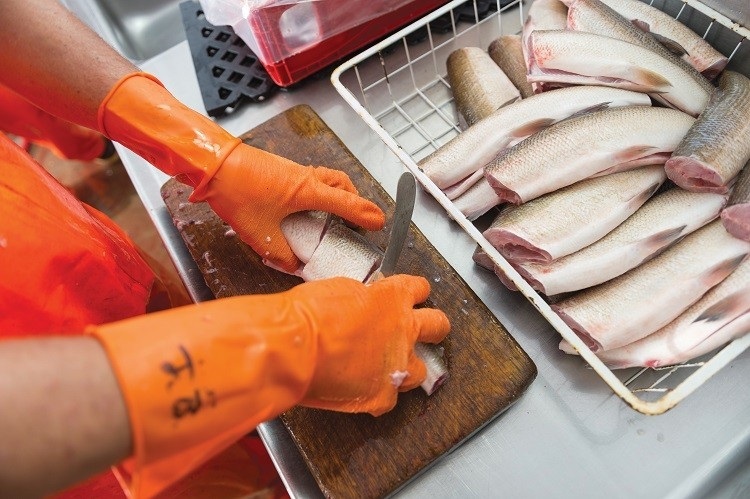 When did you know you wanted to pursue a career in fisheries? Jessica: I took the summer off from graduate school in 2003. Mark Halvorson asked me to come to Cornucopia, Wis., to help on the fishing boats. I never knew it would be so much hard work and long hours. I’ve left several times to do something different. I returned within a month or so each time. I finally took a position in a hospital lab in December of 2014. Every day I am off from lab, I go fishing or work at the fisheries, sometimes both jobs in one day. Hard work and being on the lake are rewarding, and I just can’t give it up. Jessica: The federal and state laws and all the rules, regulations, fees and paperwork/computer work that is required for a commercial fishery that processes and sells fish. 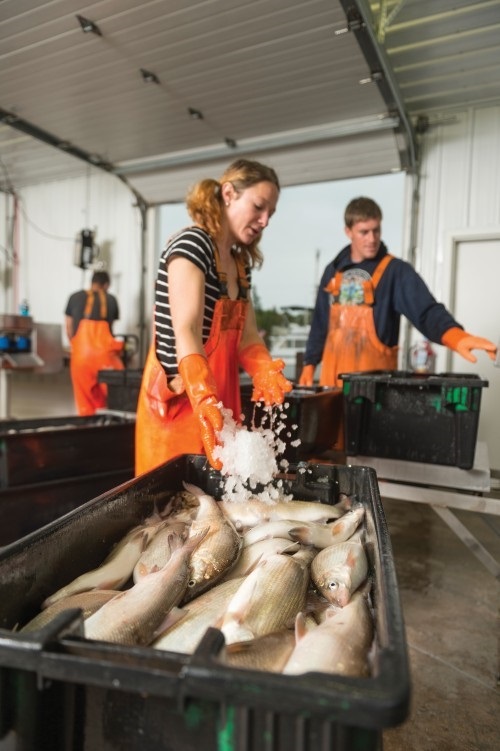 The state of Wisconsin Department of Natural Resources commercial fish reports, boat licensing, commercial licenses, temperature logs, filleting logs fish sold logs, wholesale reports, HAACP plans for everything we do. I never expected so much paperwork! Jessica: Fish are totally unpredictable. So many people ask what a “normal” day’s catch is. There is no normal. Every day is different. Some days you’ll get a lot, some days you won’t. It’s never the same. Ever. That goes for whitefish, trout and herring. It would be very interesting to know the fish migration pattern. But I’m glad we don’t. I guess the mystery of where the fish are makes the job more interesting. Jessica: Yes. Wisconsin state laws shut down the fishery during certain times of the year so the fish can spawn. We are totally on-board with that. You don’t want to put yourself out of a job, after all. We have a limit on how much lake trout we can catch and also size limits. Lake trout is the only “sport fish” we can keep. Jessica: Most of us working at Halvorson Fisheries are part-timers with other jobs, retired from other jobs, or seasonal help. So, the business employs about 20 people during the herring season in November and December, and 14 during the busy summer months. 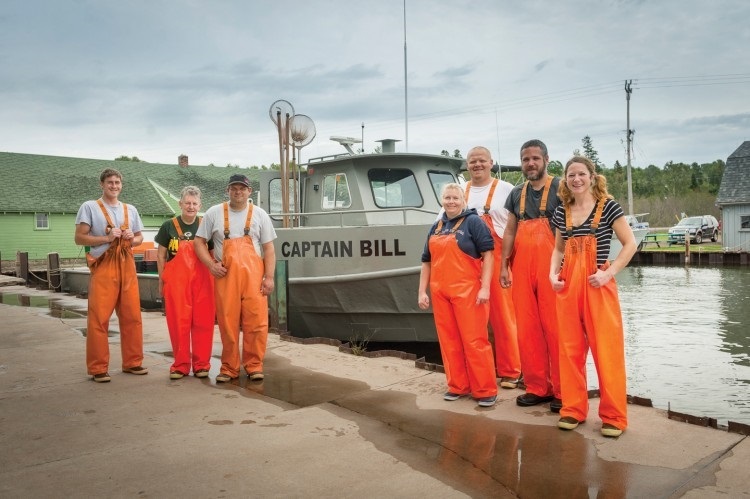 The Halvorsons of Halvorson Fisheries include father Dean, mother Maurine, and sons Mark and Cliff, all originally from Bayfield, Wis.
What is your connection to Sea Grant? Jessica: I have received the Minnesota and Wisconsin Sea Grant newsletters for years now because of my interest in the Great Lakes fisheries. When the “Eat Wisconsin Fish” campaign came out in 2014, I sent away to receive the promotional materials. I was just surprised that they contacted Halvorson Fisheries. I guess a regular person doesn’t really think their job is something unusual until someone expresses interest. Hard work and being on the lake are rewarding, and I just can’t give it up.